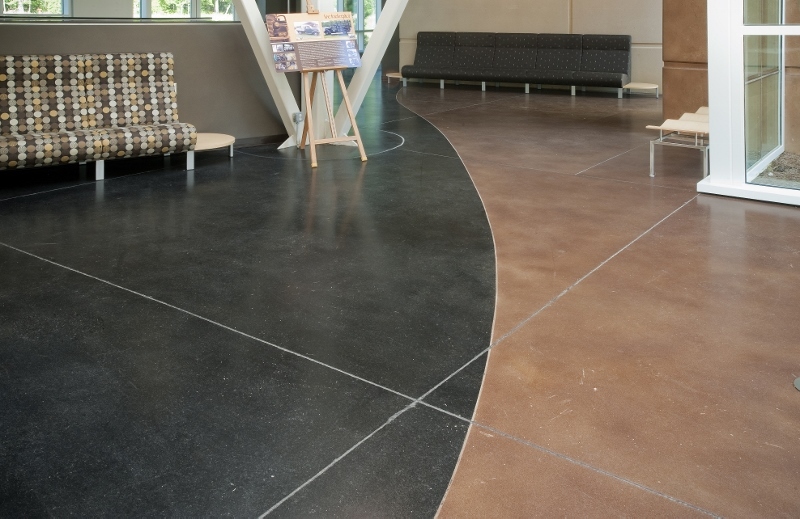 The SMECO project consisted of providing a highly decorative stained and sealed floor in the main lobby and principal hallway of the new LEED building. The architect wanted a very vibrant floor that complemented the environmentally friendly feeling of the new LEED certified building. In addition to staining and sealing the floor, Hyde installed curved sawcuts to help control cracking and divide the two stain colors. This curving layout was complicated by the fact that the hallway changes elevation and we had to modify the curve to ensure they maintained excellent aesthetic appeal! As you can see, the results are stunning! All the new occupants enjoy this key architectural feature in their new building!